"Right now, I think the most important thing is to protect the Affordable Care Act"
Gil Cisneros, a Democrat running for Congress in the traditionally conservative enclave of California’s Orange County, is backing off his support for single-payer style healthcare reforms in the general election after supporting them during the primary race. When the race to replace retiring representative Ed Royce (R., Calif.) was getting started in August 2017, the Orange County Register reported that every Democratic primary candidate in the race, including Cisneros, supported Medicare for all, although they all noted "it will take time to make such a transition." In the same article, Cisneros mentioned his support for Sen. Bernie Sanders's 2016 presidential race. Sanders has backed a Medicare-for-all plan that would costs $32.6 trillion over 10 years, requiring historic tax increases, according to the libertarian Mercatus Center at George Mason University in Virginia. During a May 7, 2018, NextGen America forum featuring Democratic Congressional candidates, Cisneros readily raised his hand when asked if he supports a single-payer health care system. He also raised his hand to show that he backed California's decision to become a sanctuary state and didn't raise his hand when asked if he supports local police coordinating with ICE. "I think you all passed with flying colors," the moderator remarked after the Q&A session. "Good work, team." NextGen America is an environmental advocacy group created by billionaire hedge fund manager Tom Steyer. 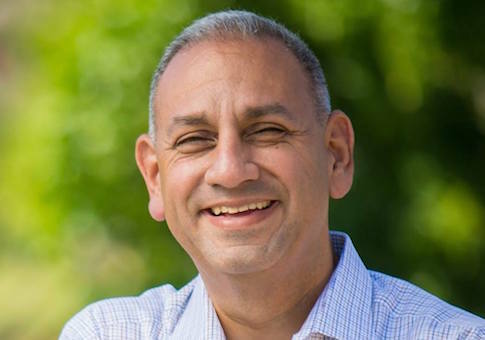 Cisneros, a former Navy Veteran and Frito Lay manager, is running in a tight race against GOP candidate Young Kim, a small business owner who previously worked as a community outreach staffer for Royce. During an appearance Tuesday with a local radio show hosted by Larry Mantle, Cisneros downplayed his prior support for a single-payer health care system and Medicare for all. When Mantle directly asked Cisneros "Do you support the single-payer plan," Cisneros said his focus is on preserving Obamacare from further Republican attempts to dismantle it. "Right now, I think the most important thing is to protect the Affordable Care Act, protect those with preexisting conditions," he said, referring to an incident in which his father and mother lost their health insurance coverage when his father was laid off after working for a company for 25 years. "Right now, the most important thing to me is protecting the Affordable Care Act, making sure that we negotiate with pharmaceutical companies to help bring down the price of pharmaceuticals drugs," he said. Mantle further pressed him the single-payer and Medicare-for-all questions: "So, at this point, you don't support the so-called Medicare for all?" "I think that it's something we can start working towards, but I think right now, being practical, the best thing that we can do right now is protect the Affordable Care Act," he said. "Republicans have been trying to get rid of it, and they have been chipping away at it. They got rid of the individual mandate, which has raised the cost of Covered California here by 10 percent. We need to stop that." The Cisneros campaign did not respond to a Washington Free Beacon request for comment on the shift away from strongly backing single-payer and Medicare for all. Recent polls have varied wildly on the campaign's state of play. A UC Berkeley Institute of Government Studies poll released last week and conduct in late September gave Cisneros a 1-point lead over Kim. A Monmouth University poll conducted in mid-September said Kim was ahead by 10 points. Kim edged out Cisneros in the district's jungle primary, which pits competitors from both parties against each other, 22 percent to 19 percent. However, the district voted in favor of Hillary Clinton over Donald Trump by nearly 9 points in the 2016 presidential contest. This entry was posted in Politics and tagged Bernie Sanders, California, Health Care, Medicare, Obamacare. Bookmark the permalink.